The first two verses of Romans 8 actually conclude the thought of Romans 7. In chapter 7, Paul has lamented the fact that although we died in/with Christ (Romans 6:3)—which means we are both dead to sin (6:2) and dead to the law (7:4)—he still finds that “the evil [he does] not want is what [he keeps] on doing” (7:19). But he concludes nevertheless in 8:1-2 that there is no condemnation any longer for this sin in the flesh because we no longer are under the law of sin and death (the law that if you sin, you die). We are now under the law of the Spirit of life. The word spirit is used in the book of Romans a total of 29 times. It takes the first 7 chapters to use up only 4 of those instances. Chapters 9 through 16 (the end of the book) record 11 instances. That means that the remaining 18 uses are all found in this 8th chapter of Romans. Obviously, Paul is making a point. We begin to see it at the end of 8:2 as Paul tells us we are free by the law of the Spirit of life. And we see it come out with force in 8:9 as Paul reveals that the Spirit of God actually resides within those who have been redeemed. Here, then, begins an unveiling of the Holy Spirit’s activity with us that flows logically from the sanctification discussions of Romans 6 and 7. We (mankind) failed in keeping the covenant obligations. Death is the penalty for breaking the covenant obligations. 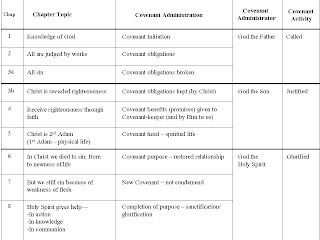 Christ kept the covenant obligations. To Him belong the covenant benefits (promises). What Christ did for us is that although He was the Covenant-keeper, He died in our place, paying our penalty. We received the imputation of His righteous covenant-keeping. But it doesn’t end there. At that point, we are essentially as Adam was before the fall—free from any guilt of sin. But God does more for us. He gives us the Holy Spirit to dwell within us and to lead us. The Holy Spirit is given to help us, first, in our actions. Romans 6 spoke of our obligation to pursue righteousness. Romans 7 showed our inability while in the flesh. In Romans 8, we learn that the Holy Spirit comes to dwell within us to help us toward this righteous living. Not only does He help in our pursuit of righteous living, but the Holy Spirit ensures our continued and developing knowledge of God. We cannot suddenly lose faith (as Adam did), because the Spirit of God testifies to our spirits that we belong to Him. Third, the Holy Spirit even helps us with our communion with God. We don’t even know how to pray as we ought. But the Spirit comes alongside to help here in the essential communal aspects of our relationship with God. This section concludes in 8:28. We are all familiar with this verse telling us that all things work together for good for those who love God. But the verse was not given to be a mere salve to soothe some heartaches on the way through life. Rather, it is there to emphasize that God did not just forgive and then let go. He is actively at work within us to bring us through this sanctification process to be like Him and in perfect relationship with Him. This is the good toward which He works all things. We now approach 8:29. The verse has been hotly debated and, in fact, has been used as a proof text for both Calvinism (predestinationism) as well as Arminianism (libertarianism). But I think that the approach to the verse often (actually, almost always) loses sight of the preceding context. Side note—Before jumping into this verse, I want to review a few rules about interpretation. Take a look at the following list that I use to guide my review of passages. 1. Determine its literal meaning. 2. Examine its determined meaning with the immediate context. 3. Develop its examined meaning in conjunction with the flow of the greater context. 4. Harmonize its developed meaning with the purpose of the book. 5. Analyze the harmonized meaning in its literary and historical contexts (author’s mission, recipient’s needs, culture, literary style and form, etc.). 6. Coordinate its analyzed meaning with the essence and overall purpose of God. It may at first seem silly to have changed the verb form of each point to an adjective in the next point, but I did so with the intent of emphasizing continuity. I don’t mean necessarily that the sequence must always be the same as you interpret. But I do mean that you should realize that interpretation is not complete until you take into account all these elements. To foreknow demands omniscience. How does God know the future when it has as yet not occurred? Some Calvinists will say the only way to know the future is to determine the future. Thus, God knows the future because He determines each act. But with this conclusion, we run face up into the problem of evil. If God determines every act, does He determine sin? I have read some people who believe so, but that He is righteous or just in doing so (they simply don’t know how He is just in doing so, but “eternity will reveal it”). This is, however, not logically supportable. It may be possible to argue from an ethical hierarchy the idea that on some occasions working with evil is necessary in order to accomplish overall purpose, but certainly not in the initial activity of evil. God simply could not have been the cause of the evil in Satan’s fall. He could not have been the cause of the evil in Adam’s fall. The definition of evil is that which violates God’s essence (goodness, righteousness, justice, mercy, etc.). God is also equal in His essence and existence. In other words, He does good because He is good. He can’t do otherwise. To base your idea of God’s sovereignty on the fact that He must act in evil while maintaining an essence of goodness is, then, not only irrational, but, I think, ultimately incoherent. There is much more to discuss with regard to sovereignty, but that must wait until next time. For now we must get back to verse 29. Those whom God foreknew are those who are the redeemed—those who receive the imputation of Christ’s righteous fulfillment of the covenant obligations. Paul uses the phrase “those whom he foreknew” not as a statement on how they were saved, but merely to identify us—the group of the redeemed. And so, what about us? Paul says we were predestined to be conformed to the image of Christ. Notice again that Paul is not arguing over foreordination to salvation at this point. He is merely concluding what the previous context of this chapter was emphasizing. Remember that chapter 6 began the discussion of sanctification. Chapter 7 showed us our difficulties. Chapter 8 gives us hope and confidence in that the indwelling Holy Spirit will support us through this process of sanctification until we ultimately achieve conformity “to the image of his Son.” That is precisely what this verse means. Paul says that we don’t have to be in panic about our inability to keep from sin (we are no longer condemned—8:1 and the Holy Spirit will help—8:13-14); we don’t have to be in panic about keeping a grip on our faith (the Holy Spirit testifies to us—8:16); we don’t have to be in panic about our inability to commune rightly with God (the Holy Spirit intercedes—8:27). In other words, our sovereign God will work all things for His purpose. Therefore, rest in the fact that all the redeemed (those whom he foreknew) are destined, foreordained, determined, purposed by God to become sanctified—conformed to Christ, so that we may truly be brothers and sisters with Him in perfect relationship. So then, Paul says in verse 30, it is God that has done it all. …what?...verse 30 says that? how? The chart below provides a summary of these first seven and a half chapters, noting the working of God in them in calling, justifying, and glorifying.